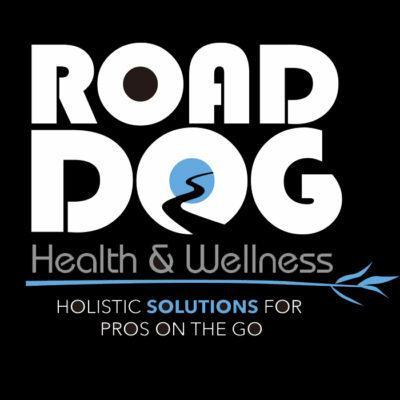 The mission of Road Dog Health & Wellness is to support the whole health of touring entertainment and business professionals, to keep you performing at your vital best for many years to come. I’ve spent decades on the front lines in the music industry – living out of suitcases, in vans and tour buses, hotels and airplanes, side-by-side with international musicians and crews. This experience has given me a firsthand understanding of the health challenges a rigorous and irregular schedule present and a high degree of familiarity with the acute and chronic issues that repeatedly arise. Retainer group services for Artists/Bands, Management Companies, Recording & Production Companies. All individual services can also be scaled and customized to accommodate groups of people. Let’s discuss your need and vision! Seasonally rotating classes and lectures See menu for current offerings. Keep your artist roster, employees, or lineup feeling, and performing their best. Road Dog Health & Wellness specializes in both concierge and retainer wellness services for festivals, venues, recording studios, hotels, management companies, record labels, production companies and more. Practicing Herbalist, Nutritional Therapist, and Holistic Health Coach. Specializing in serving touring entertainment and business professionals. I’ve spent decades on the front lines in the music industry – living out of suitcases, in vans and tour buses, hotels and airplanes, side-by-side with international musicians and crews. This experience has given me a firsthand understanding of the health challenges a rigorous and irregular schedule present and a high degree of familiarity with the acute and chronic issues that repeatedly arise. In my practice, I specialize in working with touring entertainment and business professionals, to design protocols for wellness and self-care that can be implemented within the realities of your lives on and off the road. Natural wellness consultations are customized to your unique health issues, history, goals and constitution. We work together as a team to formulate a plan that fits the whole YOU, with the foundational belief that no person and no body are the same. Recommendations may include diet, herbs, supplements, lifestyle practices, referral for complimentary modalities and more. Do any of these sound or feel familiar? I can help. All consults are individualized, based on the foundational belief that no two people or bodies are the same. I believe in providing you with the highest level of comfortable, respectful and confidential care. Learn to nourish yourself for vitality on a tour budget and amenities, and at home on limited funds. This can be done as a stand alone service, or as a personalized service following a consult (to suit your customized health plan). $50 per hour. Group rates available. Bring your usual grocery list for tutoring for on how to stay vital at home on a budget. Initial consults are 90 minutes. During which, we will go over your health history, talk about your nutritional habits, viewing the whole person from a physical, mental, emotional, and spiritual place in order to get to the root of what is causing imbalances. Expect to have a customized plan when you leave. Depending on what is indicated, I may either custom formulate (see below), or suggest herbs or supplements from other reputable sources.You will want to expect to have at least (1) 30 min – 1hr follow up appointment depending on the complexity of the issue. For more complex or long-standing issues, you may want to consider prepaying a discounted block of consults. We have physical addresses in Manchaca (South Austin) and Dripping Springs, TX. For remote clients, we can use phone, skype, facetime, etc. From the information we gain from the consult, we can create person-specific formulas perfect for you as an individual. General purpose formulas can be found in our shop. Keep your staff performing like the rock stars you hired them to be. Prevent burn out. Keep sharp. Less missed work and sick leave. Greater mental focus and stamina. Coordinated and designed by someone who understands the gig. All services can be scaled and customized to accommodate groups of people. Let’s discuss your need and vision! Group education for your company employees, band, crew. We offer many custom packages, please give us a call to discuss your needs and budget. Events Coordinate multi-discipline wellness zones, drawing upon my background of event planning and music industry experience, and utilizing my network of holistic practitioners of various modalities. Festivals Professional Road Dog Herbalist on- call or Herbal first aid station, stocked and staffed by a professional herbalist/nutritionist with decades hands-on experience in the music industry and live production world. I know the drill. Making sure the acts you’ve booked stay well, and perform at their best. Studios Prevent session down time! Get the most inspired takes when everyone is feeling their best. Sickness during studio time is a budget buster.